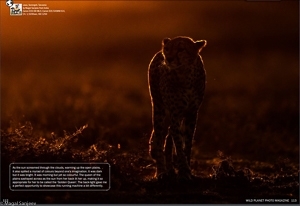 This rim lit image of a Cheetah, shot in early morning light is featured in Wild Planet Magazine. 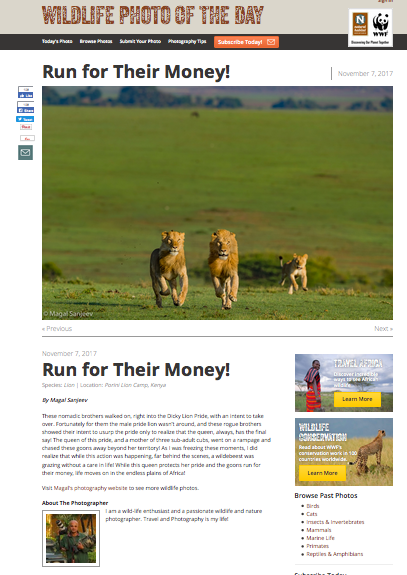 This was made during my 2018 Serengeti-Tanzania Trip. 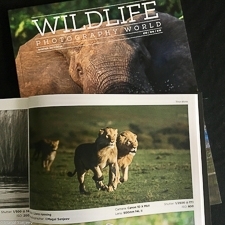 My image featured in Wildlife Photography World Magazine in Yourshot section! 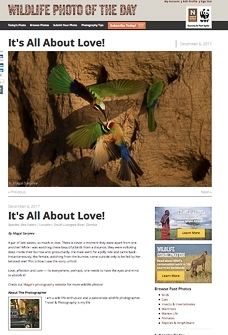 My Image featured in Wildlife Photo Of The Day. Title: Its Family time! 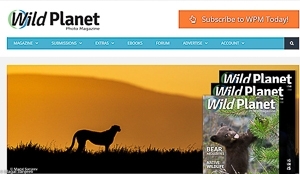 My Image featured in Wildlife Photo Of The Day. Title...in the end... that Final Look! This juvenile serpent eagle tucks into its live supper even as the prey, a lizard, struggles and gives a final look before it was ripped apart! When I was shooting this scenario, it made me feel as though the lizard looking right into my eyes, pleading for help. That moment was so emotional, but well, that's a way of life, in the wild! Nature has its own rules! 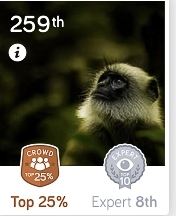 My Image featured in Wildlife Photo of The Day. Title: It's all above Love! A par of bee eaters, so much in love. There is never a moment they were apart from one another! Life is mixed with lights and shadows! It applies to one and all including the big beasts out there! These brothers moving slowly through the shadows and looking up to the light as they gear on to look for their own land and territory! This is a battle we all fight all through our life until we ourselves see the end from it! One Rule and for all! 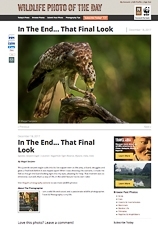 My Image Featured in Wildlife Photo Of The Day. Title: Searching for the Lost One! This Young Cheetah was searching for his sibling all through the morning and desperately calling! So much for love, so much for togetherness and that too in the wild! A touching moment and I departed from the place hoping he would soon be together with his sibling! Venue: Southern Serengeti, Tanzania. Canon Gear. 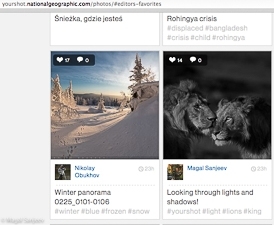 NatGeo Your Shot - Editor's Favorites. Title: Brother's for Life, Together for Life! Brothers for Life... Together for life... 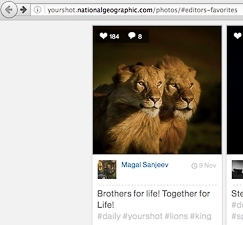 I wake up in the morning only to find one of my images seen in NatGeo's Editor's favorites! Perfect way to begin my weekend! Small dose of happiness in life! These nomadic brothers walked on, right into the Dicky Lion Pride, with an intent to take over. Fortunately for them the male pride lion wasn't around, and these rogue brothers showed their intent to usurp the pride only to realize that the queen, always, has the final say! The queen of this pride, and a mother of three sub-adult cubs, went on a rampage and chased these goons away beyond her territory! As I was freezing these moments, I did realize that while this action was happening, far behind the scenes, a wildebeest was grazing without a care in life! While this queen protects her pride and the goons run for their money, life moves on in the endless plains of Africa! Canon Gear Venue: Porini Lion Camp, Mara, Kenya. East Africa. 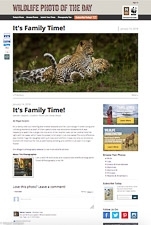 My Image Featured in Wildlife Photo Of The Day. 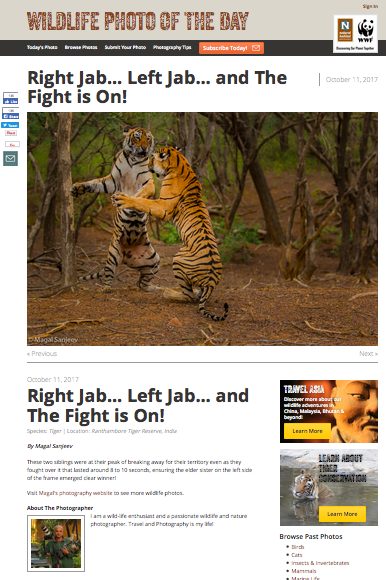 Title: Right Jab, Left Jab and the fight is on! These two siblings were at their peak of breaking away for their territory even as they fought over it that lasted around 8 to 10 seconds, ensuring the elder sister on the left side of the frame emerged clear winner! Canon Gear Venue: Ranthambore Tiger Reserve, India. The mother leopard was resting on a tree, however the cub didn't want to sit idle! 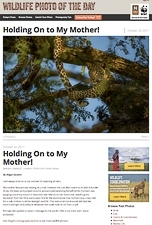 A bundle of joy, she leapt and jumped around, precariously balancing herself (while my heart was popping out of my mouth in fear) then she held on to her mom's tail, watching the Savannah from her little starry eyes! She let the world know how mothers play a key role! For a cub, mother is all the strength and life. This mercurial cub ensured she had her mom's strength and safety in whatever she could hold on to! Even a taill Perhaps she wanted to send a message to this world—She is my mom and I stand protected!. Canon Gear. 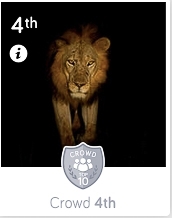 Venue: Porini Lion Camp, Mara, Kenya. East Africa. 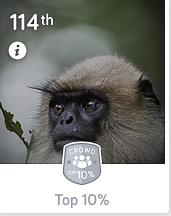 WWW.Photocrowd.com - Crowd Choice - Top 10% (Apes Section) In Awe or In a State of Shock? This Indian Langur Monkey looked either in Awe or Shock as it watched few wild-dogs far across the bushes. While its fellow-mates were screaming and running towards safety, perched high in one of the branches, i thought he looked beautiful but yet stand-still! Canon Gear. Venue: Nagarhole Tiger Reserve, Karnataka, India. WWW.Photocrowd.com, Stood Expert 8th Place (Apes Section), Crowd Choice Top 25%, Title: Can you hear me, Oh Lord? In a golden-lit morning, this Indian Langur Monkey, presumably, looks up-to the skies, seeking help from the almighty or perhaps wondering when the unseen hand of god will come to help! The situation was all his mates had left him alone and sitting all by himself, he looked quite lost. When I made this image, he was so intensely staring at the sky, may be, praying for his family to return! Canon Gear. Venue: Nagarhole Tiger Reserve, Karnataka, India. In a moonless night, as the majestic king walked on, it was nothing but bliss and heavenly to capture. It seemed as though he was storming into the light through the darkness. Used Search Light to make this image. Canon Gear. Venue: South Luangwa River, Zambia, Africa.